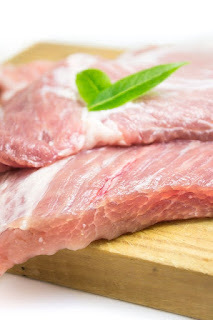 Lean meat according to United States Department of Agriculture(USDA) is considered as a meat that has less than 10gm of total fat,4.5gm of saturated fat and 95milligrams of cholesterol. It is one of the best sources of dietary Iron which is important for pregnant women, menstruating women,adolescent girls,endurance athletes and infants.It is also very important for the red blood cells. Lean meat provides nutrients such as Iodine,zinc,vitamins especially vitamin B12.Vitamin B12 helps in blood formation, DNA synthesis, energy production,it also support the nervous and immune system. Lean meat is low in calories therefore it helps in weight loss and in maintaining body weight.Lean meat from poultry is a good source of selenium which helps the immune system. Lean meat contains complete protein and it provides the essential amino acids to the body.Adequate protein is essential for healthy hair and nails. All these nutrients are easily absorbed in the body. To make lean meat cut off excess fat from meat before cooking it. Beware of salted, preserved and smoked lean meat because they contain chemical properties which may lead to increase in health risk.